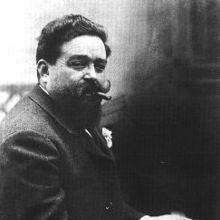 Isaac Manuel Francisco Alb�niz y Pascual (29 May 1860 � 18 May 1909) was a Spanish pianist and composer best known for his piano works based on folk music idioms. Many of his pieces such as Asturias (Leyenda), Granada, Sevilla, C�diz, C�rdoba, Catalu�a, and the Tango in D are amongst the most important pieces for classical guitar. The personal papers of Isaac Alb�niz are preserved, among other institutions, in the Biblioteca de Catalunya.